Today, I’m celebrating the fourth anniversary of Fat Pitch Financials. That’s right, Fat Pitch first started on August 12, 2004. Back when I first started this blog, I never dreamed that people would actually read it. Now I have 2,025 free feed subscribers and a growing list of premium paid subscribers of my Contributor’s Corner service. Today, I am also be celebrating the fact that Fat Pitch Financials has served over 1 million page views, 1,054,491 pages to be exact at the time of this writing. This year alone, Fat Pitch Financials served 482,497 pages to 257,214 visitors. Supposedly, 68% of this years visitors were new to the site according to my stats counter. Are any of your favorite posts missing from this list? I’ve added several of these top posts to my new tabbed sidebar under the “Best Of” section. I’ll be updating that section routinely, so any suggestions would be helpful. 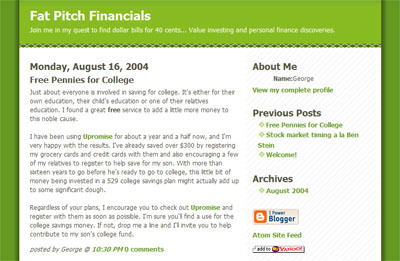 In addition to the evolution of Fat Pitch Financials, it’s hard to believe that my simple little blog has morphed into several spinoffs. Some were short lived, like Fat Pitch News. 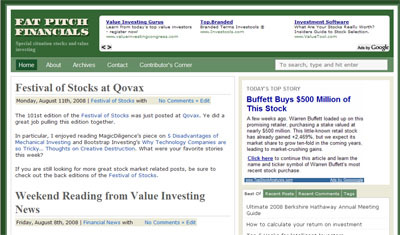 However, Fat Pitch News helped spark in October of 2006 the idea for Value Investing News, which is now even more popular than Fat Pitch Financials in under two years. 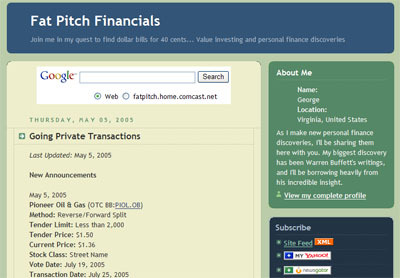 In early 2005, I created the going private transactions list, which in turn evolved into Fat Pitch Financials Contributor’s Corner. Contributor’s Corner now not only covers going private transactions, but also odd lot tender offers, spinoffs, split-offs, and other special situation opportunities. My goal is to continue developing Contributor’s Corner into a more application oriented service. As I work towards my fifth year of Fat Pitch Financials, I look forward to discussing some meaningful portfolio numbers. 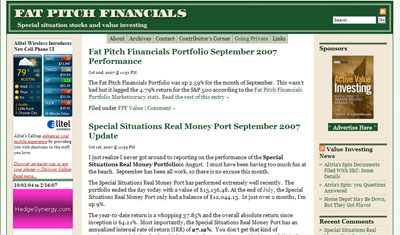 As you might know, I track two portfolios here at Fat Pitch Financials. The first one is the Fat Pitch Financials Port and it is up over 30% since inception back in 2004. It is now sporting a 7% average annualized return. The second portfolio is the Special Situations Real Money Portfolio. It is a small portfolio that is a bit younger than the Fat Pitch Port. However, it has already produced a 60% return, which comes out to an impressive 20.75% average annualized rate of return. There are not many other blogs that track performance and very few have been doing it as long as I have. Since the beginning it has been my goal to maintain performance numbers as a way for my readers to understand my experience with investing and to learn from my actions. I look forward to being able to share five year performance numbers next year. 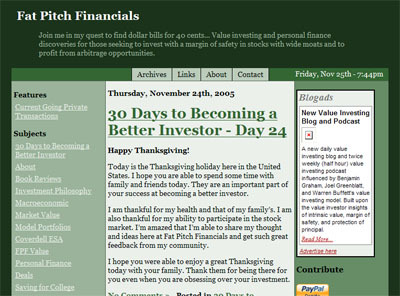 Congratulations for a great job on the site and your additions to the investing community. I haven’t been around for 4 years, but in the time I’ve been a reader, your site has been very helpful, entertaining and resourceful. Thanks Jae Jun. I too hope I don’t have to change my layout for quite some time. The first two changes were on Blogger, so when I switched to WordPress in 2005 I needed a new layout. From 2005 to 2007 the underlying page layout stayed fairly constant, but I had to make changes as WordPress was updated and as I received feedback on the look of the site. It is amazing how much online techology has improved over the past few years, and I’m sure the rapid rate of change will be just as fast in the future. We just need to be prepared to respond to the evolving online landscape. Happy Birthday and may the blog enjoy many, many more. Cheers! I have been a user for less than one year, yet I deeply enjoy the site, the carnival and the news site. Thanks John and Dividend Growth Investor. Congrats George! Wow, I’ve been reading your site since 2005 – time goes by fast! 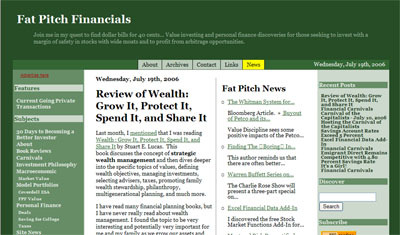 I’m thrilled to hear that you’ve been reading Fat Pitch Financials since 2005! I had no idea. Not many folks knew about my blog back then. George: That is quite an accomplishment. Congratulations!